NOAA/NCDC: June 2009 – second warmest on record globally | Watts Up With That? There’s some really interesting things going on with global temperature. On one hand we have UAH and RSS which show Global Temperature anomalies near zero, while NCDC/NOAA and GISS (which derives from NCDC data with their own adjustments added) show large positive anomalies. Last month, NOAA had May 2009 to be the 4th warmest on record globally. Meanwhile NASA UAH MSU satellite assessment showed it was the 15th coldest May in the 31 years of its record. This divergence is not new and has been growing. Just a year ago, NOAA proclaimed June 2008 to be the 8th warmest for the globe in 129 years of record keeping. Meanwhile NASA satellites showed it was the 9th coldest June in the 30 years of its record. Of course the obvious question “who’s right” will be the subject of many posts to come, but I wanted to get this out there for discussion. There’s some interesting things going on with the NCDC data. The combined global land and ocean surface temperature was the second warmest on record in June, behind 2005, and tied with 2004 as the fifth warmest on record for the year-to-date (January-June) period. The global ocean had the warmest June on record. The ranks found in the tables below are based on records that began in 1880. What is truly interesting about June (besides the wide discrepancy between global data sets) is the time period with which the onset of the warming occurred. Some say it has to do with El Nino developing in the Pacific. Perhaps, but the El Nino conditions we see now are not comparable to what we saw in 1998, yet we have global temperatures being reported that are comparable. It is an interesting mystery, and it will be interesting to see how it plays out and what is discovered. Stay tuned for more on this topic. July 16, 2009 in Climate data. Why I tend to trust the satellites. As posters on other threads have already noted, the latest daily temps show recent jumps up in temp (check ch05). The July numbers are sure to be higher — possibly as high as what NCDC said June was. Good grief, those in the UK must be all out diving in the Thames to escape the blistering heat. Poor Siberia, all ablaze with millions of sqare miles roasting in a merciless summer. No wonder Palin resigned…she’s beating feet to escape the frying pan Alaska has turned into. The Ukraine and the Steppes are fried to a crisp. My God, the so. half of Greenland is a blast furnace. We’d better pitch in and send some relief, Hundreds of millions if not a billion people are going to wither and die in the 2009 Inferno. Sea Surface Temperature is a meaningless metric. We don’t know what its relationship is to air temperature above the ocean, or the ocean temperature itself. Hence, it doesn’t tell us if the atmosphere is warming or if the ocean is warming. It is only used so some highly questionable pre-satellite data such as sampling ocean temperature using buckets over the side of ships can be used to give a century long temperature record for the entire globe. I really wish climate scientists would fess up to the fact we simply don’t know how much warmer the Earth has got over the last 100 years or even we can’t even be sure it has got warmer. The point is a satellite operating for 3-6 years uses a single, calibrated and verifiable sensor to cover the globe making thousands of measurement points. A single sensor which can be checked against ground sensors which only measure the temperature for a distance of a few feet at best. When you compare this measurement system in space to the compounding errors from thousands of uncalibrated, unverified, lower precision sensors spread thinly across the Earth’s surface it is clear what is going on. Ground based sensors cannot produce a global measurement with any accuracy under a degree if the error budget was being done correctly. Each sensor has an unmeasured error, which combines to create a huge error in ‘global temperature’. A satellite sensor has a fixed error source that can be calibrated (self checked) many ways. There is only one error source, not thousands. I mean, does anyone still do basic math anymore? Something is amiss. Data is being manipulated once again to fit someone’s agenda. Is 1.6 trillion dollars and control of the world’s energy supply motive? If sea surface temperature measure anything, it is the rate at which the vast quantities of heat absorbed by the oceans from sunlight are released to the atmosphere and then lost to space. That is, it measures the rate at which the Earth’s climate is cooling. NCDC got a new blender? Temperatures are going up at airports due to people flying to warmer places. Apparently those places are all overseas. It is wearing really thin, but will it work long enough to get cap n trade and Copenhagen adopted? Tip on comparing surface and satellite data sets-I’ll assume you are using LT (MT is where the strongest signal should be, but LT is more tightly linked to surface temperature behavior)-first, for individual months, find the average anomaly over the period 1979-1998 in the surface data sets-this will give you the annual cycle and the base period average-take this out of the surface data. Now, either multiply the surface data by a factor of about 1.2 or divide the satellites by the same. If the data sets agree on the amount of warming, there should be no trend in the differences. I think you will tend to find that ain’t the case. From that I gather that Jane already believes developing a green economy is necessary and that NOAA will play a role in that development. The emphasis on science is somewhat diminished in this light; more likely this “development” will guide “science”. It probably doesn’t hurt that they knock the base period back to 1961-1990 which is only like, almost 20 years ago, before most of the warming that got everyone all hot and bothered. That includes around 20 years when there were cooler temperatures in the 60’s and 70’s. If you go to NOAA’s site and type in any given city/state, then scroll to the bottom where it has climate information, climate data, past weather information, etc, then click on daily climate report, they use 1971-2000 as the “climate normal” period. I wonder if we are comparing apples and oranges here in terms of anomolies? The graphic calculated the anomolies based on 1961-1990 baseline, whereas the satalite record only starts in 1979. Wasn’t it colder globally between 1961 and 1979? So wouldn’t one expect the NOAA anamolies to be higher? Was June 2009 the second warmest ever? The satelite data does put that into question. If the temperature anomaly is because of El Nino, how does that help the cause for those professing it is CO2? Atmospheric warming happens after surface warming, is the gist of what is being put across to explain the difference. Isn’t that a direct contradiction to the models? There is something very wrong here and I am beginning to think I should a lawyer to figure it out. Begins the ramp up to Copenhagen. Well, I can’t wait to see July! It’s getting scary here in Northern Arkansas. My thermometer shows 64 and dropping. The low was changed to reflect 67. We’re already below that and dropping. The forcast lows for the next three days ARE IN THE FIFTIES! Plus it’s raining every day. Some of the storms have been horrific with lightning strikes much more than 60 per second and lasting for hours like that. I’m serious. The strom last night was so bad that I didn’t sleep at all. The strikes were all around my house. Getting a storm in July is normal, but usually they’re “squawl lines” that push on past fairly quickly. The storms the last few nights are nothing like that. They last for hours with massive lightning. In fact, I was laying in bed tyring to count the strikes lighting up the room. It was impossible. They came too quickly. Cold air meets warm Summer Gulf air. Nightmare storms. I don’t have cable. Are they reporting on this? Seriously… Are they? I’m 40 years old and a 6th generation Arkansasn. I was scared last night. I was listening for tornadoes for more than 4 hours. This is the second massive storm this week. Sorry, weather isn’t climate. But the weather here is strange and strangely cool. Andy, have you ever been right on any topic regarding climate? The SH sea ice anomaly is currently plus one million sq kilometers. My understanding is that ice covered water is simply excluded from the SST data. So seas will be warmer on average because more is ice covered. WHOOSH!!! That one went right over your head, Lamont. You are right that something is hinkey, but its pointing at UAH issues, no issues with the other temperature records. It’s called the “Copenhagen Effect”. Indeed they do – as established by an international treaty. That strongly suggests that UAH does not understand how to process their satellite data. REPLY: We got your point the first time you posted all the links, no need to double up. BTW your posts keep going into SPAM due to your email address having scriptkiddie.org in it. With an email like that, spam autobanning is a given. You might want to get a respectable email address. I would think one would want to compare June 2009 to all Junes as far back as the records go…1880. So if the base period is 1969-1990, then why the “NOAA proclaimed June 2008 to be the 8th warmest for the globe in 129 years of record keeping”. That’s one small leap for NOAA, one giant leap for Copenhagen. Pulling a rabbit out of a hat, they compare all 129 years to 29 years. Easy as pie, just drop those other 100 years in the trash. No one will e-ver know. For this scientificly illiterate layperson this appears to be a curious phenomenon. Over at Lucia’s and Pielke Jr’s they have been discussing the spike in the UAH dataset for July 14 and what that may mean in relation to El Nino and satellite monitoring. I have absolutely no idea. Look at how hot Siberia is again. Is that for real this time? If I were other countries who want our jobs I’d put the stations in the hottest places I could find. Lamont. The problem with your line of criticism in this case, is that RSS is also giving about the same anomaly reading for June as UAH. Anyone else find it curious that a couple of the biggest, reddest land areas on NOAA’s map seem to fall in areas of the world that have the fewest reporting stations? And indeed, observing record positive anomalies with (the beginning of) an average El-Nino event IS a sign a warming took place. I already said that when we had the 7th or 8th warmest years during long and deep la ninas, but nobody was listening. I just hope the Nino won’t be too strong this time. Also: there’s no need in going into conspiracy theories and the like. I mean: what are you going to say next month when the satellite anomalies will break records as well? PaulHClark (22:03:51) :It’s called the “Copenhagen Effect”. # A system is completely described by a wave function ψ, which represents an observer’s knowledge of the system. # The description of nature is essentially probabilistic. The probability of an event is related to the square of the amplitude of the wave function related to it. So maybe we need a new Schrödinger’s CAT (CO2 and Temperature?) where the temperature measurement is in the eye of the observer. Or an Everettian Many-Worlds Interpretation, the measurements are taken in parallel universes. I’m sure Mr Motl could have some fun with this, meanwhile I’m off to play some Eels. Is the global distribution of stations for the NOAA/NCDC data uniform? I know that we had a truly hot June in Europe, although July is shaping up much cooler. Parts of the US and Canada were pretty cold in June. Pretty important to be sure we are comparing like with like? Perhaps it’s about time they started measure real temperature, and not the anomaly. After all, the anomaly requires an estimation of a moving average, and it’s the generation of an average global temperature which is so impossible to pin down. It seems like they have weighted the game in their favour by chasing anomaly values. Anyway, this should make a lot of people sit up and take notice. Hopefully somebody will establish a true standard by which future measurements will be made and predicted. Yes, they want our jobs. They already have most of our best industry, our Federal Reserve (Bernanke outsourced to China) and the UN wants our soverignity surrendered. Check out who makes our temp sensors. Hurbanovo station (Slovakia, central Europe) has +0.1deg C June anomaly compared to 1951-1980. The station is in the middle of city so the real anomaly is probably negative. It is visible also from http://ds.data.jma.go.jp/tcc/tcc/products/climate/monthly.html – select “Temperature anomaly” which is compared against 1971-2000. Gotta love the NCDC´s red spot on the Prince Edward Island, where they had frost in June. Note also that NOAA had the hottest sea surface temperature EVER. Urban heat island effect? I agree the century long record has big error bars around it, but more recent measurements do seem to be in the ballpark. The ~0.3C rise in SST between 1993 and 2003 is consistent with a rise of around 14×10^22J in ocean heat content, as determined for the sea level rise due to thermal expansion measured by satellite altimetry. SST’s have risen recently because the ocean is emitting the heat it gained and stored during the run of high amplitude-short minimum cycles. Now the sun is quiet, the ocean is emitting heat. This is confirmed by the outgoing longwave radiation record which shows OLR increased by 4W/m^2 from June 2000 to 2006. It has stayed at that higher level since because of the protracted solar minimum. So SST’s are rising, but the ocean is cooling. The emission of heat will warm the atmosphere over the next months, until the air temperature suppresses the ocean’s emittance. There will be lag time. Just forgot to add, that NCDC graph shows here +1to +2 deg C positive anomaly. Look at the SSTs during June between southern Africa and South America. How does blue and yellow become a bunch of red dots? Looking at australian data, I would estimae a NOAA anomaly of approx. +1.5°-2.0°. However, taking the data from the australian government website with the same reference period, I would estimate an anomaly of approx. +1.0°. Rather than an anomaly, has anyone compiled a graph of actual Earth temperature? If so, anyone got a link? and select Weekly Anomaly to get absolute temps. You can select also anomaly vs 1971-2000 there. I think the issues illustrated by this widening divergence of global temperature estimates is yet another example of the sorry state of climate science. If more effort could be put into getting the basics right, then perhaps more progress to understanding would be made. It is never a good idea to build on weak foundatons. No. Fastest rate of climate cooling ever recorded. Almost all the heat in the Earth’s climate is in the oceans. Warmer SSTs mean more heat transferred into the atmosphere and then radiated out into space. Read tallbloke’s post above for more details. Osmosis of the heat from ocean to atmosphere due to sun in Lodi mode. When winter comes, it will find a cooler ocean to run amok over, bringing an even harsher time to the Northern Hemisphere. It’ll be 2010 and froze to death. Phillip and talbloke: what a special sense of physics that is… So it means having la ninas and associated low SSTs is a proof of global warming? And where do you think the released heat is going to? Right into space, just like if there were no greenhouse gases in between? And then, why do we observe an increase in SSTs going in line with air temperature in the las 30 years? In any case, I think we should be careful and wait for possible corrections for the SSTs. In my sense, it has been overestimated. Anyone done a Benson analysis on GISS data? Is there a reason to measure the anomaly vs. 1960-90? Do they just pull this stuff out of their behinds? Amazing, Gore was right after all…..nice here in Ky though, coolest July in years where I live. Re Steve Fielding case; the AGWers argumentation “the air temperatures are not important, but ocean temperatures are” are (coincidentally) immediately followed by “highest SST ever”. AFAIK, GISTEMP uses RSS data for oceans, which do 70% of the trend. Can anyone extract the RSS above ocean data for June? I think your right, rbateman, my guess is also for a cold end to 2009 and an even colder 2010 winter. It will be interesting to see how much our current qute sun wll contribute to the change. Around March 1997 (1997.25) is interesting, when the divergence between GISS (blue) and UAH (green) is almost as great as we have now. However within a few months UAH had bounced up and exceeded GISS. If you look at the sea surface temperatures (red), it leads both by a couple of months. So how’s this for a very basic theory: An El Nino-generated pulse starts at the sea surface, and takes time to pull up atmospheric temperatures. Because GISS/HADCRUT are partially sea surface and partially land, they get some impulse immediately from the sea, but the land part has to wait for the atmosphere to catch up (and then some – thermal mass?). So the ‘spike’ in the surface signal (GISTEMP) is wider but lower than the satellite one? SST has already gone up in May (June not available at time of writing), and GISS followed in June. It now looks like the satellite is spiking up as well in July, rather like mid-1997. Caveat: I’m not sure any of this is much help in determining long-term trends, but it’s interesting nonetheless! Perhaps you’d be good enough to explain how this lag works then? The troposphere starts about 8Km up so even if convected air only moved up at 1KmH it wouldn’t take long to get there. How long will it be before the troposphere starts catching up, and when can we expect this big jump in the satellite temps? Just in time for Copenhagen. July will also be another “n-th warmest month on record” etc. Bah humbug! They are showing a huge positive anomaly over Atlantic Canada for June?!?!?!?!? Sorry, I live there and environment Canada reports it as well below seasonal. I will not ascribe to malice what incompetence will explain, but does anybody check this stuff if it goes in the “right” direction? There is no way this is anything but wrong. Well, we know how “green” works. First go hug a tree. Then emote. This puts you in intimate touch with nature. After all this, it is only necessary to say the first thing that comes into your head, and it is bound to be the absolute truth. Next get a committee of such people together and you have – GREEN SCIENCE. The experimental method is so seventeenth century. Here at 92°W, 45°N we had one week of warm summer weather in June. Last weekend I needed to wear a long shirt and jeans while sitting in the sun watching a sporting event. 64°F yesterday. Not a single strong hot weather thunderstorm all summer. At least the map shows we are in the middle of a big blue patch. Until verified by an unbiased source, I don’t believe the big hot spot in Siberia. The GISS map shows PA as being a+3 degrees while my local observations show a 3-6 degree below average. you ask how good NOAA’s global data be worse than local data in Australia and elsewhere? It is simple (and trust me, I work for NASA and this is not beyond the pale). They averaged it (or smeared it) with other data to raise it up. They can rationalize why they need to over ride or lower the weighting of the cooler data. They just need to agree on some lame excuse to dilute good measurements with bad. These people do not care. Their jobs are now tied to the alarmists, and in this economy people will do anything to have or keep a job. Do you really think the Shuttle accidents were not caused by higher ups telling people lower down to be quiet or they can be replaced? If we government can let little tin dictators destroy two shuttles, what makes you think the properly placed idiots can’t screw up some simple math with their own agenda? Seriously. The way to fight back is to run scenarios with the same data that takes out the smearing. Make the assumption the satellite data is solid and that the ground based sensors are only there to do local validation of the sat data. What is the answer when we process the data with these assumptions, where we don’t ‘fill in’ holes by averaging the two sets? What does the last 3 decades look like under these assumptions. Show a range of assumptions and how they change the processing methodologies and weights and produce a range of answers. BTW, there is no way June was the 15th warmest for the last 31 years and the 9th warmest over the last 129. Just not possible. If your math comes up with that result – it is wrong! I don’t care how you average it. That’s not the point. Instead of thinking about data sets with errors think about having perfect knowledge and running numbers. That can’t happen with perfect knowledge. Either June 2009 is 8th, 15th or higher (if there were some warms spikes before the 31 recent years). What the data tells me, when you get two numbers like this is the math is wrong. It could be the way the averaging is being done, but it is more likely it is how the measurement error is being handled. As I said before, Sat data is many orders of magnitude more consistent than a bunch of sparse surface based sensors. If the surface sensors can’t produce the same results as the satellite, it ain’t the satellite that has the source of errors. Flanagan: “Note also that NOAA had the hottest sea surface temperature EVER”. Saying “EVER” is extraordinarily stupid. We’ve only been recording temperatures a VERY short while. In future, please say, “on record”. A quick check of temperature here in mid North Carolina shows we were cooler here in May and June 2009 than last year and much cooler than 2004 (mid cycle 23) I have also noticed the daily min and max temp morph upwards by 2 to 5 degrees F by the next day so my believe in the accuracy of government data has hit bottom as my believe in government corruption skyrockets. As people pull on sweaters instead of turning on the fans and AC they are going to start smelling a rat. Compound that with reports of how Veggies are not growing in the newspapers and they will KNOW theer is a rat. Can you say Cap and Trade? Question: If there is warming due to CO2 does it follow that the surface should warm before the troposphere? GISTEMP seems to have the most annual (harmonic 30) energy, although it’s pretty small. Can I propose a guest post next month? Serious, I for one appreciate a warmer who is at least trying to put forward a measurable science based argument. With regard to RBateman’s early comment, June was warm and dry in London, particularlty the later part of the month. The effect was obviously anthropogenic – the new roof on Wimbledon centre court precluded rain for two weeks. July on the other hand has been ordinary to a bit poor so far – high teens to low 20s, quite cloudy and showery. All in all, close to a typical British summer. Ah, hang on… Looking at the last decade only, which is the period “Lamont” is claiming an increase for, UAH has markedly more energy at 12 months (harmonic 10). Where I live the ‘normal’ high is 82 right about now. We’ve had a few days above that but today it’s supposed to be 70 and continue in the 70’s for days. It’s been a chilly summer. BUT like normal NOAA and GISS will tell us that we had a above normal July or a barely below normal July. Yet when we actually do barely have above normal they tell us we were drastically above normal. I think they need to work on their fudging of the numbers to become more accurate. I was farming in 1998. This ain’t no 1998. Does anyone know where a map of the temperature sensors used for the global measurements is? I have searched the web and can’t find it. I guessing we are seeing the same kind of “smearing” of high temperatures from some stations just as in Steig’s Antarctic trend analysis. I wonder what Jeff ID and Ryan O could make of the data. On that note, is the raw data even available? AJStrata (05:16:00) : One approach would be to just average together the actual readings and not try to “impute” the missing data. It’s not perfect but I bet it’s a better approach than whatever statistical fairy dust NASA and NOAA use. If true, that is an elegant mechanism. Based on what, Flanagan? NASA? GISS now has June 2007 as being the warmest or second warmest month on record. For some reason 1998 cooled, according to thier datasets. But NASA get its surface data from primairily from NOAA, which in turn has a database heavily weighted to Norh American stations. And the majority of those stations are from aerodromes, which are listed as rural (ie little to no UHI adjustment). To make things worse (or more complicated) 75% of the global weather reporting stations have closed since 1960. The majority of those stations were rural. What NOAA and GISS are doing is comparing apples and oranges. Comparing the years 1934 to 2008 when in 2008 there were less reporting stations, and more urban enviorments (ie huge concrete tarmacs) will result in a very predictive trend (marked warming). As others have noted, some of the regions (or gridcells) that have the highest positive anomalies (East Asia, Siberia, Artic) do not have a single reporting station. They may have many decades ago, so all we can surmise is that the folks at NASA and NOAA are splicing thier own extrapolated trends on to old data. This isn’t science. This warming is coming at the right time for the AGW crowd… A few months before cap-and-trade is to be voted on in the Senate followed by Copenhagen. I read somewhere that a massive six thousand page climate report is coming out in about a month. Well, I know that weather is not climate and all but I am watching Le Tour de France right now, live on TV, they are climbing the Alps, and IT IS SNOWING!!!! Well, either that or fine hail, it does like something in between snow and hail, actually. Thanks for posting this interesting theory. Only if this question is answered do we get somewhere. And better let us do it quickly, preferably before September 8th. I was just in Jacksonville Florida, touring a 1700’s sugar cane plantation. We were told there and in St. Augustine that the climate there was now too cold for sugar cane and oranges, so those crops have moved to southern Florida. If the world’s climate is “warmer than it’s ever been”, well, WUWT? It’s friggen 59 F at 9:40 CDT in Minneapolis. Almost had frost up in the “Arrowhead” last night. I’ve been predicting “hammer hard winter” for about 9 months. to 72 F, barely comfortable. Have the satellite date been adjusted with respect to ground stations with the errors Anthony has shown us these have? Could it be possible to adjust them back according to surfacestations.org and see what truth is? Well Nick, I can already say that during the early stage of an El Nino, the Walker convective cell is weakened which slows down the mixing of the different atmospheric layers. But there is also the seasonal problem of UAH, which shows oscillations around the anomalies, with a minimum in May/June. Strange, in my sense. uruderra: they are in the Vosges, not in the Alps and it’s raining, not snowing. If El Niño conditions continue to mature as projected by NOAA, global temperatures are likely to continue to threaten previous record highs. Have they PROJECTED global temperatures?…. GISS is a phony operation. Starting with the release of their December 2008 data I’ve been tracking what they’ve been doing with the data between January 1998 and November 2008. Well here’s what they are doing. ^^^^ That’s all from the same January 1998 thru November 2008 time frame. I’m not including the new data afterwards. It’s the same 131 months. Yet somehow GISS has managed to make the increase in global warming in that time frame grow and grow with each months new release. Simply amazing. Remarkably Cool, we are talking about frosts and freezes occurring in July!!! Temperatures currently in the nation’s heartland are more typical of April or October than July across many locations. Highs will struggle to reach 60 Friday across the Upper Peninsula of Michigan and the Lake Superior region of Minnesota. The high in Chicago will briefly touch 70, Detroit will struggle to get past 70, and Minneapolis will never reach 70. Many places will see highs a good 10 to 18 degrees below normal. What is going on? Well, a northerly breeze, cloud cover, showers and the jet stream being unusually far south for this time of year will all play a varying role in the chilly air. Look for another cool day in the same locations Saturday after a very chilly night overnight. Some areas in northern lower Michigan have seen temperatures drop to near freezing (We are talking about frosts and freezes occurring in July!!!) recently, and while temperatures will not drop that low thanks to a breeze and some cloud cover, it will still be chilly Saturday night. Story by AccuWeather.com Meteorologist Mark Paquette. I think what bothers me is the base period that 2009 was measure against – 1961 to 1990, which would have been “cold” biased, and would make this year seem much warmer. Wy is there no standard? Why is just a 30 year average used vice a much longer term time frame that actaully may show a cyclical pattern? There appears to be some lag between the two, but its hard to tease out because ENSOs vary so much in magnitude and temperature is so noisy. There definitely was a faster surface response than satellite response at the start of the last major El Nino back in ’97. If you want to remove the ground station mess from the satellite data you begin with just the satellite data itself. The challenge there is how to handle the change over from one satellite to another, and the aging (drift) if the sensor. My proposal would be to identify 3-6 well documented ground stations around the globe which have good performance and span all 31 years of the satellites. These are the statistical anchor points for the satellite drift and transitions. If, on average, these 6 stations indicate a life time change in Sat1’s sensor from +.5°C to +1.1°C we can adjust for sensor aging. If the same 6 stations detect Sat2’s bias dropping to +.3°C when it took over for Sat1 we can not only adjust for drift but transition. The key is to only use a small number of ground reference points so you don’t add mountains of sensor errors from the ground. Turn the tables, use the satellites to question the ground sensor errors and calibration. It is, in fact, the proper method scientifically and statistically. Single spacecraft sensor with known and measured performance is the only way to check the performance of thousands of independent sensors with varying precision and health. When you do this, the NOAA-GISS anomalies are no longer global warming, but data showing how bad the ground sensors are performing! Which is the how this should have been computed in the first place. “If you want to remove the ground station mess from the satellite data you begin with just the satellite data itself. The challenge there is how to handle the change over from one satellite to another, and the aging (drift) if the sensor. When you do this, the NOAA-GISS anomalies are no longer global warming, but data showing how bad the ground sensors are performing! Which is the how this should have been computed in the first place”. Thanks to WUWT, Anthony’s Surface Station Project and AJStrata we find the road back to sanity. Who is going to undertake this job and provide us with a non bias temp record? Lamont is yet another the hacks trying to resuscitate the non-issue with the the UAH data. •	There are many more dots (non-zero anomalies) on land in the BLENDED vs. the LAND only map. •	Greenland, for instance, went (by my count) from 3 red and 1 blue dot (in the LAND only map) to 16 red dots (no blues) in the BLENDED version. •	Look at the filling-in all over Sudan, Libya and Sub-Saharan Africa (Congo, Namibia, Kenya, etc. ), the western portion of Australia, Siberia, Tibet, Xin Jiang, Myanmar between the two maps, not to mention Mexico, Central and South America. Sudan, for example, went from (perhaps) one red dot in the LAND version – that might actually be in Egypt – to all red dots in the BLENDED version. Also what happened to the blue dot that seems to be sitting in the Red Sea – what’s it doing in the LAND (only) map anyway? There’s no trace of that blue dot. •	There are other places where the blue dots were replaced by red or were shrunk – e.g., off the coast of Alaska and New York (?) and Boston (?). •	The red dots at the Antarctica, on the other hand seem to have disappeared (except) for a blue dot in the Peninsula, which was shrunk. It seems that NOAA has developed a methodology to impute temperature anomalies where none exist – isn’t that what Trenberth said he was worried about?! In any case, any such methodology is based on models (algorithms) and assumptions. Anyone checked these out? One big assumption is that you can impute temperature anomalies (as opposed to temperatures) from locations that are miles away. I wish they would only show temperature anomalies at actual measurement sites – including where the sea surface temp measurements have been made. It is impossible to believe the data coming out of any organization that does not publish all raw data, computer code, and any other relevant material. After the incidents below, that goes quadruple. I’m sure I’m preaching to the choir here, but if you haven’t already, go take a look at these. Look at the Hockey Stick and the Antarctic reconstructions articles. All NOAA is doing is spreading their own errors around and claiming ground truth. The fact is as they ‘blend’ they increase their error bars, which would mean it could be warming or cooling – which if they were honest would mean they don’t know. The only thing these surface temp maps are good for are virtual toilet paper. In my opinion something is wrong with that map. I live in Danmark and I spent a lot of time in Portugal. In Danmark and North of Germany we had themperatures well above the average in June. In Portugal we had the opposite. Cooler themperatures even than Danmark a below the average. How can they show that map? Heat in the ocean? No way. In Portugal the waters were bellow the average and they still today. And the red dots are there, in that map. Something is wrong. I expected blue dots in Portugal and red dots in Danmark. Not the opposite. It is impossible. That map is [snip]. But not this year as a 1939 cold record is broken. I am hardly curious to see how NOAA will turn these kind of events into a heat wave. I agree on the toilet paper. There is a nice red dot in the UP of Michigan in their picture. From Accuweather website June 09 was 3.3F below average for the local airport (CMX). So far July 09 running 6.5F below average. If this is what is like in the red dots, I feel for all of you unfortunate enough to be living near any of the big blue dots. Climate CZAR Carol Browner pushing the Climate Bill in person talking to every Senator in person. Keep them calling before you have to study Russian or Chinese obligatory. why are NOAA’s temperatures for australia 0.5° to 1.0° higher in average than the (maximum temp) data from the australian bureau of meteorology (and even 1.0° to 1.5° higher compared to the min temp anaomaly) ? Did they add a new kopenhagen correction T = T + 1.0 ? I think there is also a difference between NOAA map and their temperature figures. Looking at the map, I would estimate an average anomaly of well over 1° Celsius, what doesn’t fit with theirglobal anomaly of 0.7°. Maybe the map is in Fahrenheit and labelled wrongly ? I don’t know if tallbloke is still around, but I am trying to see a way that LT temps could lag SST by a month or more. I read where someone said that when the sea surface warms by the few degrees for ENSO and the Sun is in a low-activity state, that the sea begins to radiate away the heat. I guess it would be more accurate to say that the dynamic equilibrium gets out of balance temporarily and for a while more energy leaves the ocean at that point than enters it. At any rate, when this happens why is there such a lag to detect an increase in LT temps? Is the rate of heating so low that the temps increase very slowly? These announcements are getting wackier every month. These bureaucrats must think we all all idiots. Here I am, wearing a heavy, long-sleeved shirt in the middle of July, for cripesake! And they are saying it’s record warmth? They’re having too many liquid lunches at the NOAA. They need to take away the gov’t credit cards and bring these people down to earth where the rest of us live. Rick, it is NOT Science. NOAA knows about the bad siting and bad calibration of the data gathering equipment and has done nothing over the years or even now to try and gather the best possible data. The entire department is therefore worthless. They are nothing more than a political boondoggle paying back their handlers and do not deserve to be called scientists. As soon as an individual starts fudging data to get management mandated results he is no longer doing SCIENCE what he is doing is FRAUD. This is no different than the “scientists” in Russia chopping of rats tails to prove acquired characteristics become inherited and reporting success, only those poor fellows had the excuss that their very lives were on the line. Thanks for all the technically precise language – it really helps. There is something termed the “mean” and the mean has a serious problem. It is skewed toward the extreme data values. So being equally precise as blending, smearing, etc., this issue seems to be much ado about very little. I see a big, red hot spot over Russia. Using the wrong month’s data again, are we? The map shows Chad as being 4 to 5C hotter than average. That’s a bit like saying Hell is having a heat wave. So I checked out the temperature data on weather underground at the various reporting locations around Chad. For example, the Capital city of Ndjamena: June 15th was relatively chilly, but it’s average temp is inflated by 10F, a new high of 111F is also recorded (review the hourly data). June 14th, June 16th are also inflated. In contrast, during the hotter part of the month June 1-8 the temperature recordings and averages at least match to a reasonable degree and seem to only be inflated by 1 to 2F. The rest of the country has such poor temperature data it is really difficult to tell, with data being only taken in the morning, or afternoon, skipped, etc. however I can’t see the 8F increase when someone takes the time to record consistently. I think a +8F heat wave should be easy to spot. Does anyone know where the raw NOAA data comes from for the country of Chad? I can’t stand the heat anymore. Hudson Bay still filled with ice…!!! What a summer! Many Chicago area residents are just shaking their heads — some pleased by the lack of heat, others disappointed at the failure of hot weather to gain a foothold here. Extremely rare mid-summer lake-effect rains were pouring down on sections of La Porte and Berrien Counties in Indiana and Michigan Friday evening — just the latest meteorological twist in a summer of topsy-turvy weather across the region. July has slipped to the coolest to date here in 42 years — its 68.7 degree average temperature running nearly 5 degrees behind the long-term (138-year) average. Friday’s 70-degree high was the first time in 53 years a July 17 temperature failed to rise above 70 — you’d have to travel back to a 64-degree high 85 years ago to find a July 17 that was cooler. In Rockford, Friday’s 67-degree high broke the record for the date, becoming the coolest July 17 high on the books. The reading was Rockford’s fourth record-low daytime maximum to fall since June 30. The average high for July’s first 17 days has been 77.5 degrees — the second coolest in the 50 years of O’Hare Airport weather records dating back to 1959. Only 1967’s 76.2-degree tally has been cooler. AGW/Climate Change, the World’s first cyberspace war. The sciences are now like Russia after Glastnost: Everybody can see a massive disaster ahead, but nobody wants to say it out loud. We are in that moment of shocked silence just before the bare-naked emperor becomes a target of universal laughter and ridicule. Well, this emperor is buck naked, just like the fairy tale. As I’ve talked with scientific colleagues in private, they are quietly nodding, yes, yes, of course it’s all BS. Pure model-driven fantasy. Really lousy, deceptive, and fraudulent selection of the data. A gigantic slap in the face for NASA. A thousand greedy grant swingers all over the world. The media chasing scare stories, and fake “scientists” chasing the media. They fed each other lie after lie after lie. It was a very profitable partnership. …the media are full of phony superstitions and the worst kind of pseudo-science. If this is the best of times, it is also the worst of times — with a fetid plague of fraud whipped up by the likes of Al Gore, who helped to put fanatics like James Hansen into power. Hansen is not a scientist. He is a zealot who uses math models to push his personal crusade. As Professor Fred Singer and others have shown, none of the climate models can “retrodict” the solid data of the past. How could any decent scientist therefore claim to predict global temps in the distant future? Global warming was always a flaming fraud, and at some level a lot of scientists knew it. They just kept their heads down — to their everlasting shame. Everybody outside the climate game just assumed the frauds must be telling the truth. All that modeling seemed to be somebody’s specialty, and you don’t arrogantly invade somebody’s specialty, do you? So the mounting fraud went unpunished for years and years, while politicians like Al Gore made sure the money went to feed the fraud. My question is, what shall we do with the science frauds once everybody gets it? The rules are very clear. Science organizations and universities have strict regulations against fraud. Proven liars are fired, and if they have stolen money by deception, they should be held legally responsible to pay it back or go to jail. Bernie Madoff is a small operator compared to James Hansen. Madoff just got 150 years. Hansen is still ranting against the plain evidence. There are honest mistakes in science. On the frontiers of science everything looks vague and debatable for a while. But you don’t drop your standards so low that any con artist can get away with fraud. That’s what’s happened in climate modeling. It is therefore crucial to re-establish the credibility of science. That means firing the guilty, and if necessary, prosecuting them. We’ll know that the sciences are on the road to health again when the biggest crooks are exposed and fired. Don’t expect it soon. But honest scientists should speak out, as many of them are beginning to do. Climate modeling has become a rubble-strewn disaster area, and historically, tainted fields are simply choked off and allowed to lie fallow for a generation or so before the first green shoots can grow again. Choke off the money, and the climate game will wither. All that accumulated expertise can be put to do something useful — like predicting the stock market or trying to beat the house in Vegas. Yeah, It was in The Vosges, but it was snowing. I was with my brother watching the TV and both of us made the same comment about the rain turning into snow when the riders were passing the summit. Yesterday, after battling through the cold and snow to Colmar to regain the green jersey, Hushovd roared at Peter Velits (Milram) for pipping him at the line. I don’t know, if NOAA averages are ok, even if we neglect their usual warming bias, but their graphic is obviously wrong, it doesn’t match their own averages, doesn’t match above graphic or the graphic from the australian land mass (which uses the same reference period), and all NOAA temperatures appear to be elevated by about the same amount. Very convenient that this discrepancy is occurring now that Congress is voting on the climate change bill. Any guess which of the temperature metrics will be reported by the media? 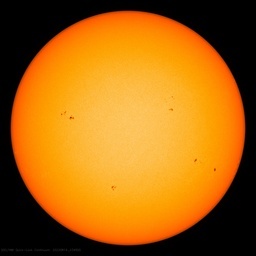 Now its easy to see how quiet the Sun really is at the moment. The prominences are weak, the coronal holes are very small, the corona (the solar atmosphere) shrunken. Eventually the solar cycle must return. The question is whether solar scientists gain insight into the behaviour of the Sun by understanding why their models failed (see below). The result can only be better science. “Climate CZAR Carol Browner pushing the Climate Bill in person talking to every Senator in person. I believe this technique is how the warmists have managed to overawe non-scientists skeptics in politics and the media–with a barrage to canned “rebuttals of skeptical arguments.” The rebuttals to the rebuttals require deep involvement in the issue, so a skeptical scientist or two, or someone like Morano (sp?) should be present. Or Browner should consent to an eight-hour debate with such a skeptic, with the taped results made available online for senators to see. Hadley just released their June 2009 value – 0.503C. This puts it in the same range as GISS and NCDC. So the conspiracy to fool the public is global. The UK Met Office is helping the US energy bill get passed…. But seriously, it would seem there is a technical reason for the discrepancy. I’ve seen many ideas around the web,. Satellite measurements of the Lower Troposphere (what is being compared to surface record) is 8km deep to surface. Surface temps are just above the ground and SSTs. They’re measuring two different depths entirely, so the LT lag might have some influence. GISS interpolates to include the poles – the whole globe. Hadley doesn’t. I don’t know about NCDC. UAH includes polar data, which are a bit buggered up by reading over the ice. This interference with spectral readings. RSS don’t do that (I think). They measure from ~82.5 north to ~70 south. UAH has a large and persistent bump in their annual cycle – around June. This suggests a problem with algorithms rather than satellkite problems. We all know UAH has had massive adjustments in the past. Neither the satellite nor the surface records are without problems. I think we can discount conspiracy theories and start thinking about technical reasons.